Fraser & Neave Holdings Bhd (“F&NHB” or “the Group”) aims to solidify its commitment to sustainable growth and profitability through continued emphasis on driving innovation and capability building. 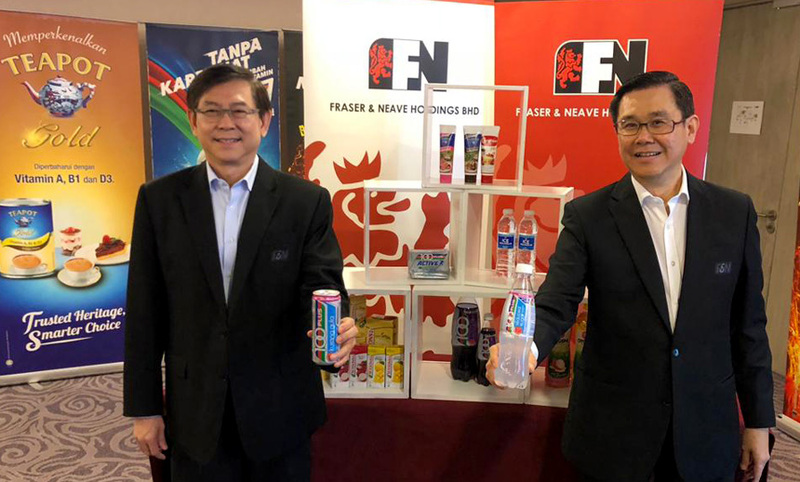 As Malaysia’s leading food and beverage manufacturer and distributor, F&NHB is ramping up its product offerings to quench growing consumer demand for healthier products and convenience, in tandem with the shifting trend in today’s lifestyles. Speaking at a media briefing on F&NHB’s financial results for the financial year ended 30 September 2018, F&NHB Chief Executive Officer, Lim Yew Hoe said that innovation is crucial not only to the Group’s long-term success, but it is more imperative now than ever in its 135 years’ journey to also respond to consumers’ growing social and environmental concerns. This approach drives F&NHB’s strategic decisions to innovate and deliver healthier option, and more sustainably produced product. During the year, F&NHB introduced 100PLUS Reduced Sugar, with only 4g/100ml sugar and without any alternative or artificial sweetener to expand the brand’s reach beyond traditional user occasions. Response to the new product that contains 33 per cent less sugar than the original version has been very encouraging, acquiring more than three per cent share of the Isotonic category within just 3 months of its introduction. “The acceptance of consumers for this 4 per cent sugar product gives us the confidence to launch more low sugar content products in 2019 and beyond.” Lim added. In 2018, the entire 100PLUS range and F&N SEASONS Chrysanthemum Tea have been reformulated with reduced sugar and certified with Healthier Choice Logo by Malaysia Ministry of Health (MOH), along with OYOSHI Green Tea and Ice Mountain Mineral & Drinking Water. Over the years, F&NHB has also put in significant effort in reducing the amount of sugar in its total beverage portfolio. As a result, the sugar index (sugar amount in gram per milliliter of beverage) has decreased by 34 per cent since 2004. Besides that, F&NHB will tap into differentiation in packaging formats to cater to different occasions and needs of its consumers. For instance, 100PLUS ACTIVE in powder sachet was launched in FY2018 for frequent travelers and people who are constantly on the move. The Group’s portfolio of Sweetened Condensed Milk and Evaporated Milk are now also available in flexible packaging from single serving stick and squeezable tube to 20kg bag to meet all consumers and customers’ needs. “While we fulfil consumers’ demand for more convenience, the Group will continue to minimise the impact of post-consumption waste through research and development on environmentally-friendly packaging and explore more initiatives to increase the recyclability of the packaging used in our products,” said Lim. 100PLUS Active, OYOSHI and F&N SEASONS range of products are now produced with the Group’s new Cold-Aseptic Filling Polyethylene Terephthalate (PET) line at the Shah Alam plant that uses 40 per cent less PET resin packaging. Despite cautious consumer spending, 100PLUS, F&N SEASONS, OYOSHI and F&N Fun Flavours maintained leading position in their respective categories in FY2018, while F&N’s stable of Sweetened Condensed and Evaporated Milk remained the undisputed leader in its category in Malaysia. New introductions have also helped 100PLUS to further expand on its already prominent market share in the isotonic category. In Thailand, F&N reinforced its number one position in both value and volume share in the total condensed milk market with its continued emphasis on marketing and branding initiatives. Commenting on the Group’s full year results, Lim said that the notable results exemplified F&NHB’s commitment to addressing the needs of its customers and consumers while staying ahead of ever-changing trends in the industry. “Despite the challenging market conditions, we remained focused on capacity and capability building; cost optimisation and extraction of synergies; leveraging on consumer-focused innovations to deliver new and unique product offerings; and expanding the reach for our export business. Moving forward, we will continue to execute strategies that ensure continuous growth,” said Lim. F&NHB’s capex for the past three years helped facilitate insourcing production capabilities to further lower the Group’s operating cost and costs of goods sold (COGS). The new Cold-Aseptic Filling line for PET bottles has the capability to boost its bottle production at the Shah Alam plant by 10 per cent annually. With the evaporated milk line at its dairy manufacturing plant in Pulau Indah running at full capacity, the Group is investing in a new RM15 million production line to further expand its capacity. Lim added that these initiatives would ultimately lead to greater F&NHB’s export capability, which is steadily growing, to surpass the Group’s RM800 million export sales target by 2020. “We are pleased with our progress in existing and new export markets and have already identified strategies to further grow our export revenue.” Lim added. He added that the management is waiting for more details and clarifications on the sugar sweetened beverages excise tax before they are able to fully assess the impact. The Group recorded a positive revenue for the financial year ended 30 September 2018 which grew by 0.2 per cent to RM4.11 billion from RM4.10 billion in the same period last year. F&NHB’s profit before tax was up 19.5 per cent to RM422.7 million for the financial year ended 30 September 2018 compared to RM353.7 million in the corresponding period last year. Excluding restructuring costs and other one-off items, profit before tax grew by 3.2 per cent. Profit after tax rose 19.1 per cent to RM385.1 million from RM323.3 million last year. Commenting on the performance of its Food & Beverage Malaysia operations, Lim said, “Our financial results illustrate our renewed capability to derive better cost synergies. Now that our transformation programme in Malaysia has stabilised, we will continue to drive excellence in our route-to-market executions to extract revenue synergies in this new financial year.” said Lim. In line with the Group’s performance and considering the short-term capital expenditure needs, the Board is recommending a final single tier dividend of 30.5 sen per share (2017: 30.5 sen per share) for approval by shareholders at the forthcoming Annual General Meeting. If approved by shareholders, the total dividends for the year would amount to 57.5 sen per share (2017: 57.5 sen per share).